Emma Robertson. Chocolate, Women and Empire, Manchester: Manchester University Press, 2009 ISBN: 9780719077777 (cloth). I’m currently drafting a review for Antipode on Emma Robertson’s book, but as I think its a really good book, I’d like to give you a brief taster of its themes here. Written by the historian Emma Robertson, Chocolate, Women and Empire is a recent addition to the diverse collection of monographs in the Studies in Imperialism series, edited by John Mackenzie. Her study is one of six substantial books on chocolate published in English in the last decade. William Clarence-Smith’s (2000) Cocoa and Chocolate is a far-reaching liberal history of cocoa production and the commodity chain from the years 1765-1914. Lowell Satre’s (2005) Chocolate on Trial details the intersections of Quaker faith, capitalist practice, and imperial paternalism during the Sao Tome scandal that embroiled Quaker chocolate firms in a public ethical dilemma at the start of the twentieth century. Deborah Cadbury’s Chocolate Wars (2010) illuminates the alliances and competition between Cadbury’s and the other Quaker chocolate firms during this crisis of accumulation and imperial introspection. Carol Off’s Bitter Chocolate (2006) and Órla Ryan’s Chocolate Nations (2011) are activist investigations on child labour, cocoa production and trade grounded in contemporary witness and testimony. There are three theoretical starting points that mark Chocolate, Women and Empire out from this quintet. 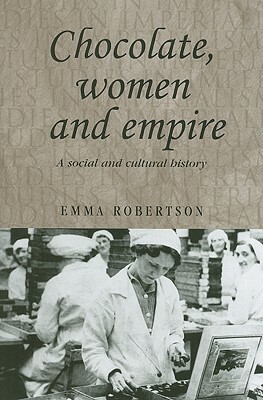 Firstly, Robertson forges a comparative framework between colony and metropole; secondly, she re-examines the ways in which local and global histories of chocolate intersect; and thirdly, she counters the neglect and trivialization of female and non-white labour on cocoa farms and British chocolate factories – “I want to give women a central role in this history” (p.86). “The name of Rowntree has been an almost constant presence in my own life. I was educated at the Joseph Rowntree School, saw plays at the Joseph Rowntree theatre, learned to swim in what was once the company swimming pool….Every weekend as a child I ate the waste chocolates purchased by my grandmother, who retired from the factory the year I was born” (p.6). Beginning as a local study of female Rowntree workers in York for an MA dissertation, Robertson expanded her study to include labour networks of the Rowntree firm as part of her doctoral research. She spent a month in Nigeria in 2002 studying “the lives and experiences of farmers who are largely absent from existing academic studies” (p.8). The unfamiliarity of this new empirical terrain is palpable: “not speaking Yoruba…how could I possibly hope to interview Nigerian women in the cocoa farming villages?” (p.8). But Robertson turns the problems of difference and representation into a core theme, placing them at the crux of her investigation: “the lack of knowledge, of connection was at the heart of the project…I wanted to confront the disconnection of women in York and Nigeria…and disturb and analyse the boundaries between women” (p.8). The book consists of five substantive chapters that examine different stages and effects of chocolate imperialism. The first chapter is a fascinating critical discussion on visual and textual representations of femininity and race in Rowntree and Cadbury adverts that, taken on its own, bears comparison as an imperial commodity study with Ramamurthy’s Imperial Persuaders (2003), Jan Pieterse’s White on Black (1992) and Ann McClintock’s Imperial Leather (1995). Developed chronologically in relation to the changing landscape of empire between the late nineteenth century and the 1960s, the reader is given a sense of how discourses of femininity and whiteness intersected with racism, class, imperial paternalism and ideas of social responsibility in chocolate marketing. 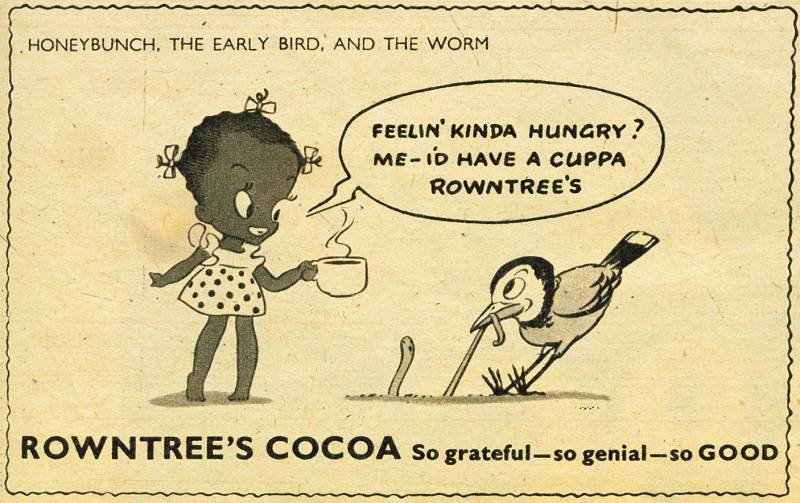 Post-war child consumers were targeted through the figures of ‘Honeybunch’ and ‘Little Coco’, these Rowntree adverts from 1947 performed the metonymic trick of turning African characters into cocoa (p.42) while making comic ‘chocolate adventurers’ and ‘civilizing imperialists’ out of them at different times (p.43-7). The second chapter is a short theoretical discussion on imperial and colonial histories of chocolate. Here, Robertson briefly analyses modern histories of chocolate that perpetuate epistemic violence on Aztec producers by rendering them exotic or invisible (p.65-68), and she critiques the biological and paternal racism performed by Rowntree and Cadbury histories, accounts that place limitations on the scope and potential of the Nigerian farmer (p.70-82). Her aim is to position her “own narrative of the origins of chocolate” (p.65) in opposition to these official accounts of chocolate imperialism, but instead of setting up this contrast, a recognition of the less benign effects of race on imperial power and alliances (see McIntyre, 2011), would have led to a discussion on the role of chocolate imperialism in the gradual erosion of direct British rule in Nigeria. The third chapter is based on interviews with fifteen female Nigerian cocoa farmers. Robertson places women as key economic agents in the farming, fermentation and local trading of Nigerian cocoa (p.110-120). Although not alluded to by Robertson, there are interesting parallels and contrasts to be made here between the cocoa based politics of Nigerian women and the sugar based politics of British anti-saccharite women from the 1790s. The relationship between women and the socially important food commodity for both eras, as producers of cocoa on the one hand, and consumers of sugar on the other, is used as platform for developing asserting political and moral power in patriarchal society. However, where anti-saccharite women were largely unable to deviate from the imperial domestic ideal of separate spheres (Midgley, 2007), Robertson demonstrates that separate spheres of home and work, public and private are brought into question by women farmers who engage in portering, trading, account keeping, and buying (p.114-116). Robertson’s most assertive arguments are made closer to York in chapters four and five. Chapter four unpacks the effects of empire on York. Robertson argues that imperial discoveries and labour were responsible for the large scale manufacture of chocolate in York, and that the city played a central role in British imperialism. Discourses of nation and empire were practiced by Rowntree’s employees in their pursuits, their diet, their reading and singsongs. The toing and froing of culture and goods between metropolis and colony is convincingly tied to the assertion that the chocolate commodity chain cannot be simply understood as a linear progression from farmer to consumer. Chapter five uses thirteen oral histories of former employees of Rowntrees to show how race and gender were performed on a daily basis in the York Rowntree factory. Included among the interviewees are three immigrants who occasionally experienced the sharp end of the construction of whiteness on the factory floor. Whiteness, Robertson argues, emerged from the elimination of bodily odours from the production line (p.204), and the fear of bodily contamination from Pakistani or Chinese workers. “People and products moved backwards and forwards across the apparent boundaries of ‘home’ and ‘empire’ in ways that challenged the outward influence of imperialism and the linear progress of the cocoa chain from farmer to consumer. The factory itself became a nexus for those intermediaries and go-betweens, a site for colonial visitors and for visiting York citizens now resident in the dominions” (p, 169). “I am happy about your visit to this place. But make sure you relay our suffering situation to the people in developed countries so that they can come in and help us. Farmers are really suffering” (Abigail A., p. 124). And we should care. The global chocolate industry is an ardent exponent of Western power. In similarity to the majority of global agro commodity chains, the global chocolate industry is buyer led (Fold, 2002), and the material and symbolic production of chocolate structurally fixes power along racial lines. Chocolate grinding and processing firms in the global North benefit from the extraordinarily low farm-gate price of cocoa, and nurture a willing ignorance and devolved sense of responsibility over the conditions of informal and migrant labour on farms in the Cote D’Ivoire, Ghana, Nigeria and Cameroon. The West African cocoa farmer is actively impoverished through the imposition of a range of high taxes by national governments, political instability, and the traditions of complex racialized internal trading systems. For example Varangis & Schreiber (2001) blame Lebanese traders in the Cote D’Ivoire for decreasing the international value and reputation of Ivorian cocoa by mixing low with high quality beans in search for a quick profit. These white traders, known as traitants, are assisted by Malian or Ivorian ‘pisteurs’ who buy cocoa for them from farmers in the Cote D’Ivoire at village prices. The Lebanese traders combine different grades of cocoa, and trade it to grinding firms in the ports at the national price (Peleikis, 2003). Farmers are additionally hampered by a graded European import duty tax that penalizes African attempts to enter the value chain for chocolate and invest in fixed capital for processing cocoa. For example in 2004, the European import tax for raw cocoa was 0.5%, compared to 9.7 % for cocoa butter and 30.4% for finished chocolate (ul Haque, 2004). Consequently profit margins are held in European and American hands where places of chocolate’s physical production (storing, grinding and processing centers) and its meaning generation (branding firms) are owned. Chocolate, women and empire should appeal to a wide readership – particularly to scholars of British imperialism and histories of consumption, and to those interested in the workplace geographies of women. The book’s central problematic is the topological and social (dis)connection between, i) labourers in different stages of chocolate production and, ii) producers and consumers in a globalizing world. Robertson historicizes the problem of consumer and corporate responsibility over distance. As she seeks to integrate the narratives of Nigerian cocoa farmers with factory workers from York, responsibility as a consumer but also as an embedded and powerful actor in the production of knowledge, becomes very much her problem too. In dealing with this weighty issue, there is much to admire in the lightness and honesty of her writing.